Results: It's known that electric vehicles could travel longer distances before needing to charge and more renewable solar energy could be saved for a rainy day if lithium-sulfur batteries can just overcome a few technical hurdles. Now, a novel design for a critical part of the battery has been shown to significantly extend the technology's lifespan, bringing it closer to commercial use. A "hybrid" anode developed at the Pacific Northwest National Laboratory could quadruple the life of lithium-sulfur batteries. Nature Communications recently published a paper describing the anode's design and performance. 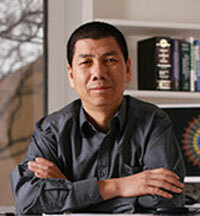 "Lithium-sulfur batteries could one day help us take electric cars on longer drives and store renewable wind energy more cheaply, but some technical challenges have to be overcome first," said Pacific Northwest National Laboratory (PNNL) Laboratory Fellow Jun Liu, who is the paper's corresponding author. "PNNL's new anode design is helping bringing us closer to that day." Why It Matters: Today's electric vehicles are commonly powered by rechargeable lithium-ion batteries, which are also being used to store renewable energy. But the chemistry of lithium-ion batteries limits how much energy they can store. One promising solution is the lithium-sulfur battery, which can hold as much as four times more energy per mass than lithium-ion batteries. This would enable electric vehicles to drive longer on a single charge and help store more renewable energy when using similar sized batteries. The down side of lithium-sulfur batteries, however, is they have a much shorter lifespan. Methods: The lithium-sulfur battery's main obstacles are unwanted side reactions that reduce the battery's lifetime. One undesirable attribute is the dissolution of the battery's sulfur-containing cathode into the battery's electrolyte liquid, forming molecules called polysulfides that then form a non-conductive deposit on the surface of the lithium anode, making the battery inoperable. 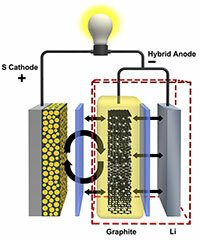 Most lithium-sulfur battery research to date has centered on stopping sulfur leakage from the cathode. But PNNL researchers determined stopping that leakage can be particularly challenging. Besides, recent research has shown a battery with a dissolved cathode can still work if the detrimental side reactions at the lithium metal anode can be prevented. So, the PNNL team focused on the battery's other side by adding a protective shield to the anode. "Lithium-sulfur batteries could one day help us take electric cars on longer drives and store renewable wind energy more cheaply, but some technical challenges have to be overcome first," said PNNL Laboratory Fellow Jun Liu, who is the paper's corresponding author. "PNNL's new anode design is helping bringing us closer to that day." The new shield is made of graphite, a thin matrix of connected carbon molecules that is already used in lithium-ion battery anodes. In a lithium-sulfur battery, PNNL's new anode design, a thin layer of carbon is electrically connected to the lithium metal, forming a unique electrochemical structure. The graphite shield moves the sulfur side reactions away from the lithium surface, preventing it from growing the debilitating insulating layer. Combining graphite from lithium-ion batteries with lithium from conventional lithium-sulfur batteries, the researchers dubbed their new anode a hybrid of the two. The new anode quadrupled the lifespan of the lithium-sulfur battery system when compared to identical cells with conventional Li anodes. When equipped with a conventional anode, the battery stopped working after about 100 charge-and-discharge cycles. But the system worked well beyond 400 cycles when tested under the same conditions using PNNL's hybrid anode. "Sulfur is still dissolved in a lithium-sulfur battery that uses our hybrid anode, but that doesn't really matter," Liu said. "Tests showed a battery with a hybrid anode can successfully be charged repeatedly at a high rate for more 400 cycles, and with just an 11-percent decrease in the battery's energy storage capacity." What's Next? This and most other lithium-sulfur battery research is conducted with small, thin-film versions of the battery that are easy to fabricate for lab tests. For commercial viability, larger, thicker electrodes would be needed to power electric cars and store renewable energy. Liu noted tests with a larger battery system would better evaluate the performance of PNNL's new hybrid anode for real-world applications. Sponsors: This study was primarily supported by the Department of Energy's Office of Science, Basic Energy Sciences, Materials Sciences and Engineering Division, with additional support from U.S. Department of Energy (DOE)'s Advanced Research Projects Agency-Energy, and DOE's Office of Energy Efficiency and Renewable Energy. Reference: Huang C, J Xiao, Y Shao, J Zheng, WD Bennett, D Lu, LV Saraf, M Engelhard, L Ji, J Zhang, X Li, GL Graff and J Liu. 2014. 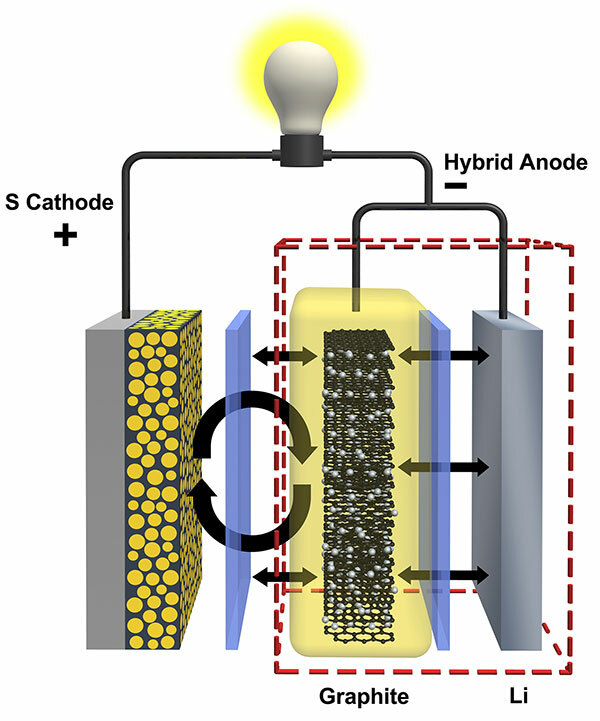 "Manipulating Surface Reactions in Lithium-sulfur Batteries using Hybrid Anode Structures." Nature Communications, Jan. 9, 2014, DOI: 10.1038/ncomms/4015.